It’s not often that the ideal photo situation falls right into your lap. Almost literally. That almost happened to me Monday Night. 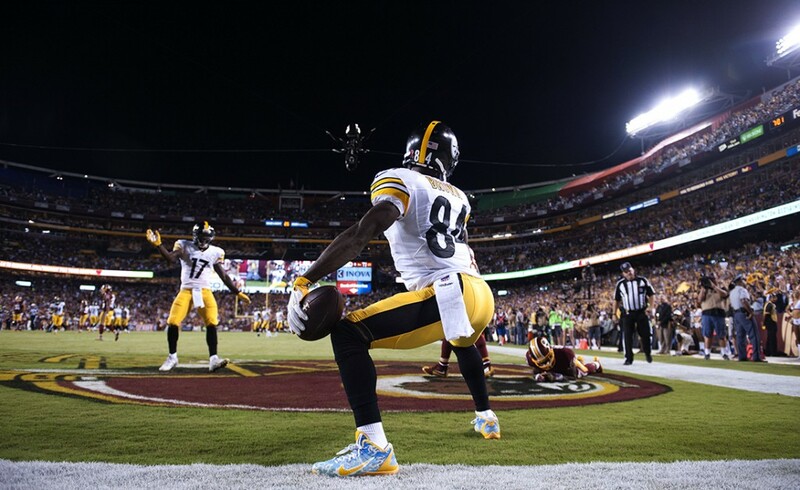 I (Vincent) was on the sidelines for the Pittsburgh Steelers opening night victory over the Washington Redskins at FedEx Field in Washington, D.C on Monday Night Football. I positioned myself in the right side of the end zone as the Steelers were driving during the second half, preparing for a possible Steelers touchdown and celebration. My eyes opened wide as Ben Roethlisberger lofted a pass towards the goal line from their world class wide receiver Antonio Brown. I dropped my camera with the long lens and grabbed the one with the wide angle at the same time that Brown ran over and stopped right in front of me. I had long envisioned the picture that seemed to be happening right in front of my eyes. A night football game, with the black sky as the backdrop. The best receiver in the game catching a touchdown right in front of me. My wide angle lens ready for the unique shot. I drop down on the ground for the perfect, dramatic angle. And that receiver, football in hand, leaping up in celebration, creating that perfect image. Everything was set up perfectly. Brown, the best receiver in the game, was now just feet in front of me. The sky was pitch black. His white uniform contrasted perfectly with the background. The ball was in his hand, and I was lying on the ground, ready for the shot I’d been waiting so long for. I fired multiple shots while I waited for the soon to be classic leap. And I waited. And waited. But the leap never came. I had some really cool images, but I was so disappointed that he didn’t jump. “Why did he just crouch there, doing nothing?” I thought to myself. I viewed it on my camera screen, and was really happy with the image, but still bummed that Brown didn’t leap. The game went on, and the Steelers won, 38-16. It wasn’t until the next morning that I found out that Brown wasn’t jump crouching, he was twerking! I watched the highlight, cracking up laughing. And after hearing about all of the hulabaloo surrounding the twerk, I realized that it all turned out pretty well, and that it was a moment that will certainly be remembered for a while!